Things have been a bit of a whirl of late, what with the silly season (which closely aligns with the festive season in these parts). Guiding days, handyman jobs, urgent fixes, hot weather, a trip out to the lake and a great deal of traipsing up and down the stream valleys in search of fish. I suppose that in some way that is an excuse for the lack of activity on this blog, although really it should have provided more than a little material to play with as well. Right now though the panic hasn’t ended, and I am heading out again over the weekend to a remote river valley which one only gets to see based on a lucky draw ticket. 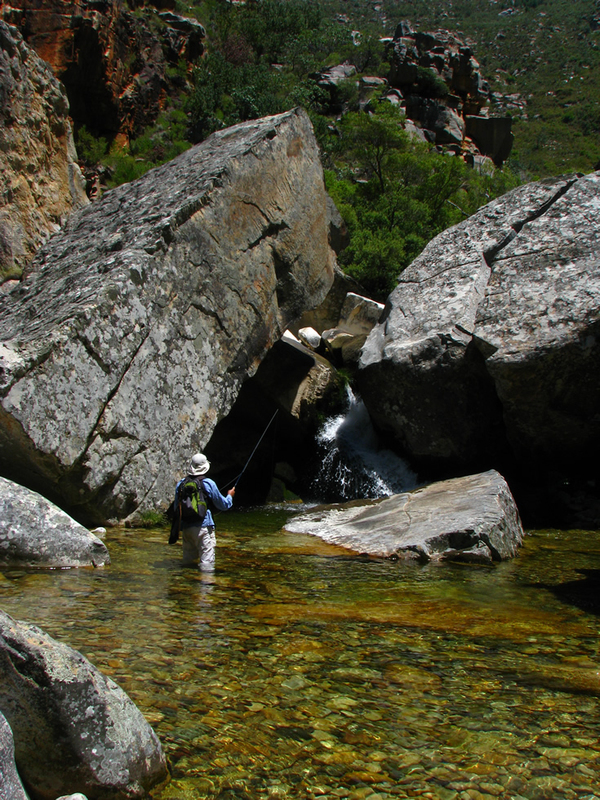 It has all been a bit of a rush and at the kind invitation of Craig Thom at Stream X, Cape Town’s best fly fishing shop, I am due to hike into the Jan Du Toit’s Rver with him in search of pristine conditions and hopefully more than a few trout. The River is something very special and worth the effort to reach it. This river is unique in so many ways as to render it virtually indescribable to anyone who hasn’t visited it previously. The hike in to the overnight camp is a couple of hours and the going is pretty steep, the river itself is crystal, benefitting from that age old conservation mechanism that protects places that require physical effort and some risk to reach. There are fairly well worn paths if you can keep on them as they cross and re-cross the river but it is a remote and beautiful piece of the countryside and demanding to fish. Not so much that the fish are particularly educated, although they are far from stupid, more tricky because the water would make a fine bottle of London Dry Gin look a tad murky, although to be fair at depth the stream takes on a slightly emerald hue, and the boulders in the river range from pebbles to the size of a double garage. Because of the hike everything needs to be stripped down to the bare minimum, my six fly boxes have been compacted into just two, one for the dry flies and another for subsurface patterns. There is plenty of room in two boxes but the heap of flies will be tricky to sort on the water, and it will take more time than usual to find the ones that I want. I shall forego the normal fishing boots and run the risk of slipping more, but carrying in two sets of footwear is unnecessarily troublesome and the wading boots would occupy too much space in the backpack so I shall walk and fish in the same pair. Leaving me with wet feet on the way home which isn’t too much of a problem and the risk of slipping which could be far more serious. Up there there aren’t any easy options of escape should one pick up an injury. Deep enough and the water takes on a brilliant emerald hue. Of course I am a fisherman so more preparation goes into the tackle than the food and camping requirements, but it all has to be stripped down. I have checked and rechecked the gear list, rod, reel, tippet and fly boxes, a spare leader or two, polaroids (in such clear water it would be a travesty to forget those), net and my lanyard with hook sharpener, nippers, floatant and such all attached. The lanyard is a winner because so long as I don’t forget or lose it it carries most of the little tools and nick nacks which I might require on the stream. Then of course there has been a little bit of last minute fly tying, it seems that the last flies tied before a trip, usually wrapped rapidly in a state of mild panic, often prove to be the most effective. I have also had to unpack my fishing vest, the one I have been using is too bulky for travel. With moulded pockets that tend to have one feeling like Mae West out on the water, all a bit front heavy, it is simply too bulky to pack and I have dug out an old and tattered vest from the past, hidden in the back corner of a cupboard, which can be rolled up and stuffed into the pack. Of course, unpacking a fishing vest is a dangerous operation, all too easy to forget something important and even if not forgotten it could be a trial to locate what one is looking for. Unpacking and repacking a fishing vest can become a little like fiddling with a solved Rubic Cube, you might never get it back to the way that it was. Hopefully with the fishing gear list all ticked off I can then move on to the logistics in terms of clothing and food. I suppose that it says something that I am far more willing to go hungry than to be missing an essential piece of fishing equipment and then again probably less keen to be cold or wet than to be starving. It all comes down to priorities, and on my list fishing gear comes first and food last, a sort of “Maslow’s hierarchy of fishing trip packing”. In short if I forget the biscuits it will be annoying but if I forget the 7X tippet it has the potential to ruin the weekend. Fishing takes priority, food and clothing come second. The real problem with these trips is that there is no turning back, up in the highest portion of this steep sided valley one is hours from the car and further still from the nearest fly shop, what you forget you do without and that’s about the sum of things. So the lists have been typed out and will be checked and rechecked, somewhere along the way, in the car or on the path I will have the customary panic that some essential item has been left on the kitchen counter, it is all part of the process, a case of backpack paranoia and which of us hasn’t pulled over to check a pocket during such a venture in the past? In the steep sided kloof the sun will leave early and arrive late and I shall probably end up sleeping for far longer than I ever would at home. The sleep though is generally interrupted by rustling in the bush at some point of the evening, a visit from a near tame Spotted Gennet that always seems to know when there are people and therefore potential food in the valley. Years back some wag wrote “Scorpion Cave” in charcoal on the side of the cliff were we overnight, that alone can leave one rather fitful when trying to doze off and if we are fortunate we might get to see dancing fireflies jetting about on the far side of the stream when it gets dark. 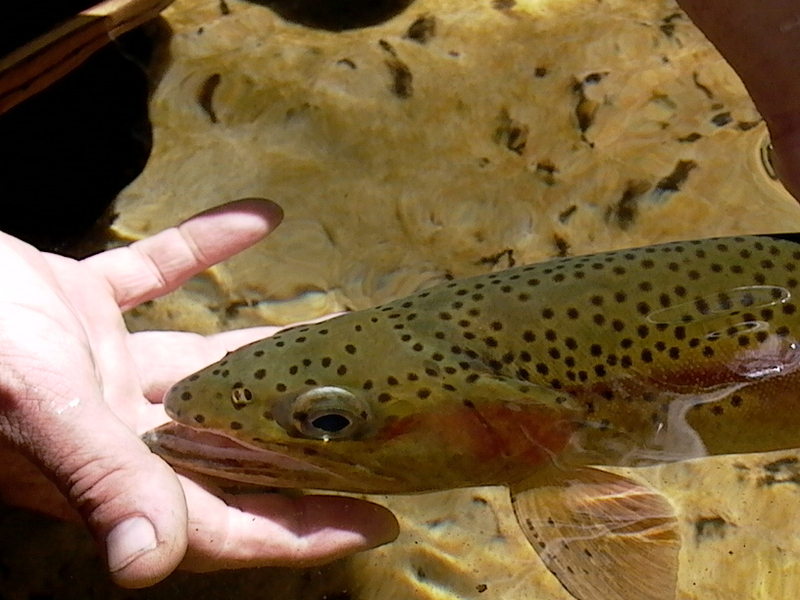 Pretty streams begat pretty fish. My first trip up this river years ago was part of a restocking programme, we all carried baby trout on our backs, suitably ensconced in plastic bags filled with clean water and pure oxygen. Twenty babies to a bag and two bags to a person. The terrain is such that the river’s fish can easily become isolated from one another due to numerous barrier falls and so we stocked a couple of fingerlings in each pool taking care to spread them out and provide the best chance of creating a self-sustaining population. For the most part it seems to have worked, although there are still sections where the trout are thin on the ground or absent completely, then it is a case of hiking to the next barrier and trying again. All in all I am looking forward to it, perhaps not the hike so much but definitely the fishing, with luck I shan’t forget anything essential but I think that I had better go and check that packing list again just in case.